Now to pick up where I left off in my last post; allow me to highlight the most common symptoms your pets may present with when suffering from a tooth ache and this will include some nauseating pictures. Burying their raw bone instead of tackling it head on (few exceptions are those dogs that enjoy hiding their bone until it ripens) and/or preferentially chewing on one side of their mouth (this can easily be missed without very close observation). 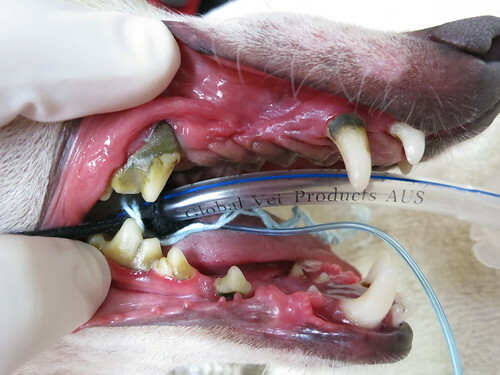 A uniform build-up of plaque on one side of your dog’s mouth will often indicate preferential chewing on the unaffected side and this can be diagnosed by your veterinarian during a routine health check. 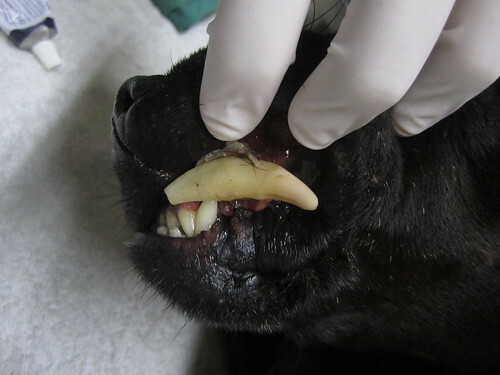 One of the main reasons that your dog may prefer to chew on one side of his/her mouth is if they have fractured a tooth. As in the case of Buster below, his owner actually heard him yelp while chewing on his bone. It did not stop him from eating but he was obviously struggling to chomp his food. Examination revealed he had fractured his upper right 4th premolar (carnassial) tooth. We proceeded with a full general anesthetic and extraction of the affected tooth. As for Lucy, this jack russell terrier came in for a dental check and was not showing any obvious signs of discomfort to her owners. I incidentally discovered she had uniform buildup of plaque affecting only the left side of her mouth. It turned out she had a slab fracture to her upper left 4th premolar tooth. I removed the fragmented surface of the tooth and did not proceed with a full extraction. My reasoning was the underlying tooth did not appear to have any exposed pulp. Her owners are fully aware she may require a full extraction later on. Tinker was another dog that did not display overt discomfort when eating. He had a mild bad breath but he would not allow us to examine his mouth. 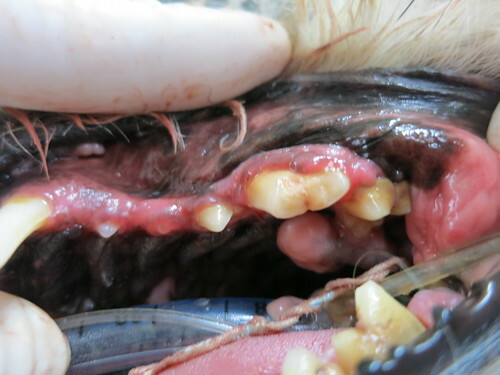 We proceeded with a full general anesthetic and discovered he had a decaying upper right 4th premolar (carnassial) tooth decay. I extracted this tooth as my dental probe revealed a large pocket of loose gums. 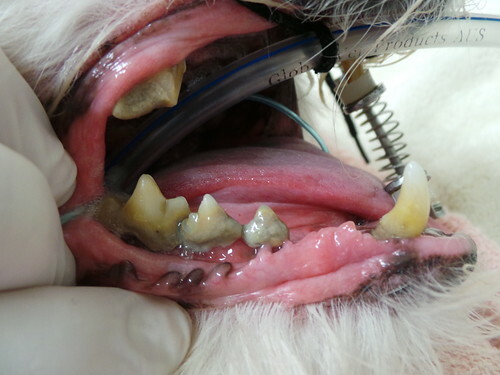 One of the most typical reasons dogs are brought to the vets for an oral examination is the development of intolerable bad breath referred to as halitosis. The bad breath develops in association with inflamed or ulcerated gingiva and mostly due to the excessive buildup of tartar and plaque. Buzz is a rescued cocker spaniel that required two dental procedures only a few months apart. 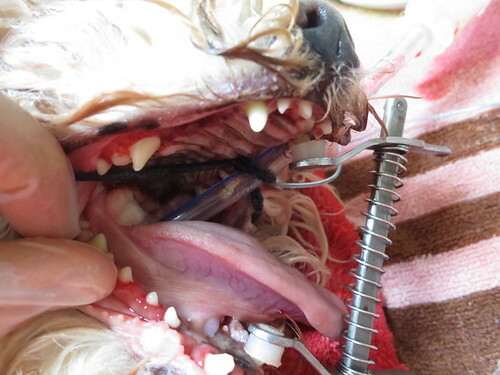 In the first procedure, he was castrated and had a dental scale. It was noted that he had have severe gingival recession affecting most of his teeth. 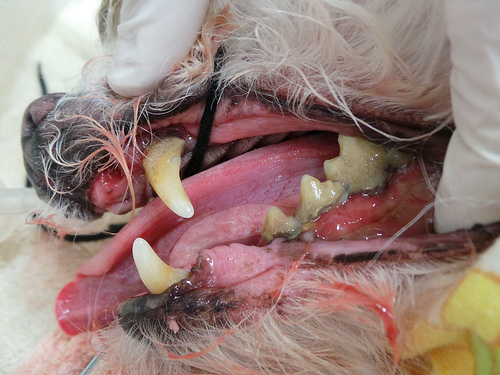 Only a few months later, he developed recurrent halitosis and painful gums and so we proceeded with another dental. 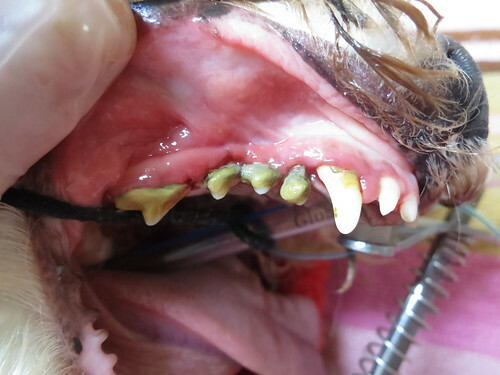 This time around, we extracted the most severely affected teeth. He may still require further extractions in the future. Please note that the yellowish staining observed over his upper left canine should be in fact covered with gum tissue. Here, you can clearly observe the exposure of the left roots of his lower first and second premolars. 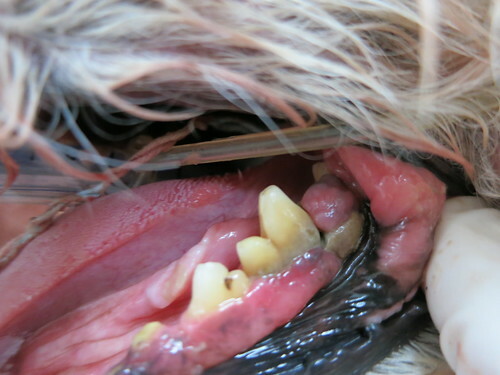 This illustrates the severity of his gingival recession. 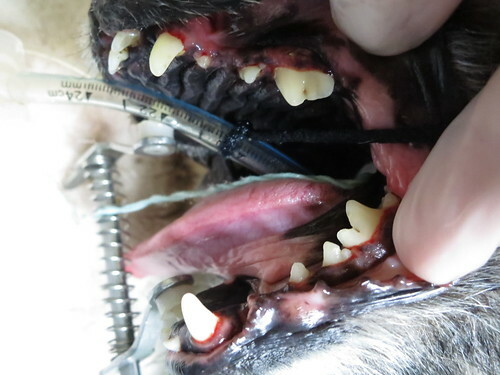 You should not be seeing the roots of your dog’s teeth. Molly is a greyhound prone to the development of plaque especially on her upper canines. Regrettably, she is head shy and will not allow her owner to brush her teeth. 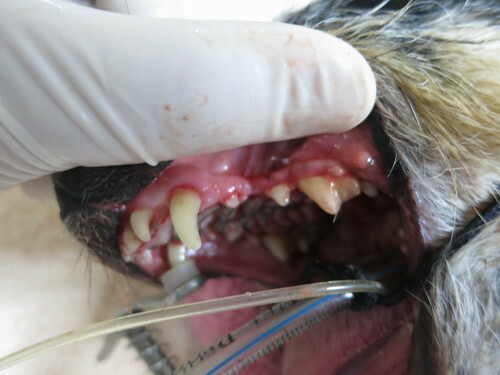 She will very likely require 6 monthly to annual dental scales to prevent progression of this condition. This was not Meggie’s first dental procedure but was a much needed one. The level of plaque buildup over her upper right 3rd and 4th premolars is horrendous. 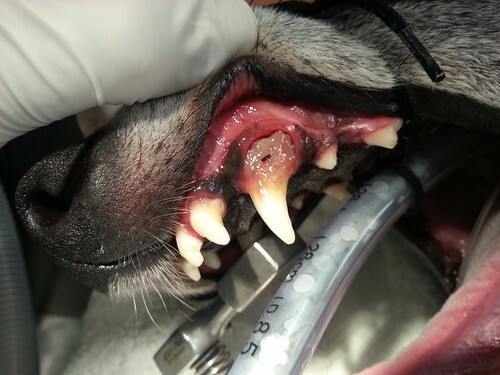 Sophie is a 6 year old Italian grey hound with a severely infected upper right 4th premolar tooth. This was her second dental procedure. Poor little one had already lost a decent set of teeth. 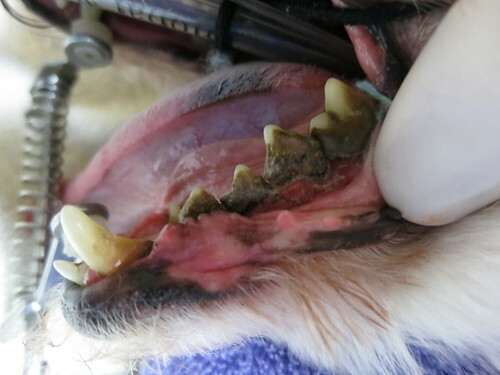 If her dental problems were addressed earlier, we may have been able to rescue many of her teeth and not just resort to multiple dental extractions. 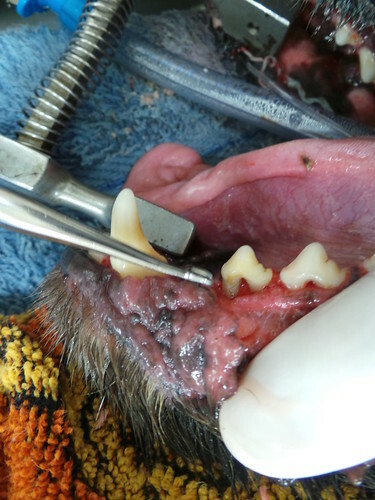 Badger is a very old Dachshund cross with some serious plaque buildup affecting most of his teeth. 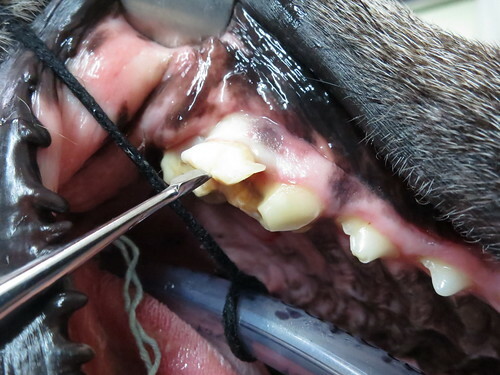 I had been trying to convince his owners to perform a dental for almost one year. They were petrified of losing him under general anesthetic since he was already diagnosed and being treated for heart disease. He recovered brilliantly from the procedure and is still maintained on his heart tablets. His owners were so thankful that I convinced them to go ahead as they have noted a huge boost in his spirit and livelihood since this was done. Can you even begin to imagine the pain he was enduring with a mouth like this ? Believe it or not, he was still eating without any obvious discomfort!?! 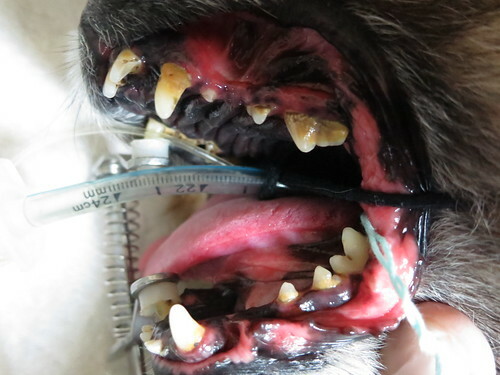 So for those of you that still truly rely on the fact that your dog’s appetite is a good indicator on how well your dog is coping with their dental disease, please think again. Now let me share with you the most classic presentation of dogs requiring immediate dental attention. 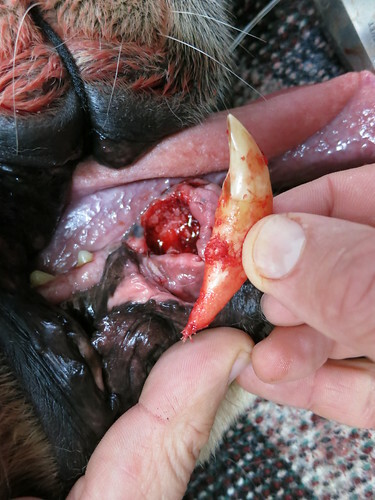 This is what your dog could look like when things go pear shaped with his/her tooth. Often clients do not realise the lump is associated with dental disease. 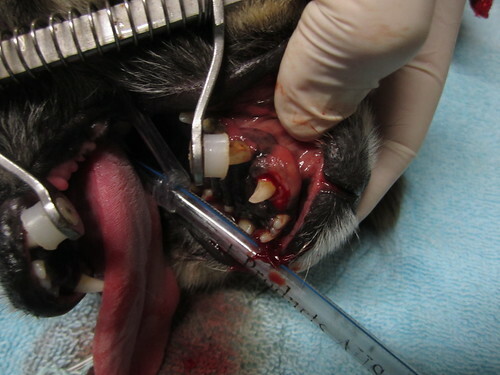 Your dog can acutely develop a tooth root abscess and the swelling in front of the eye is the point of drainage for the infection. 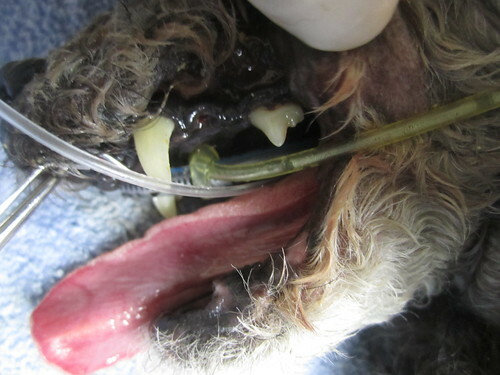 Check out poor Holden, a young dog that developed a tooth root abscess. 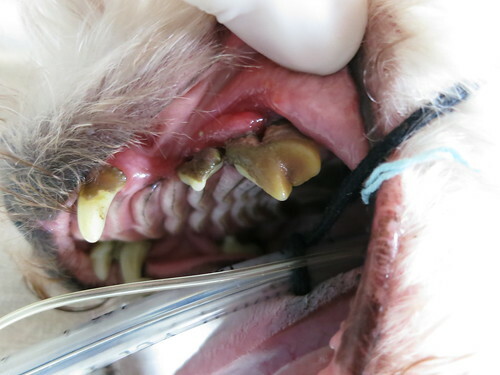 Unfortunately, this may be a situation you can’t always prevent in your pet as the root of the upper premolar or molar may have rotted with or without any obvious external damage to the visible tooth. 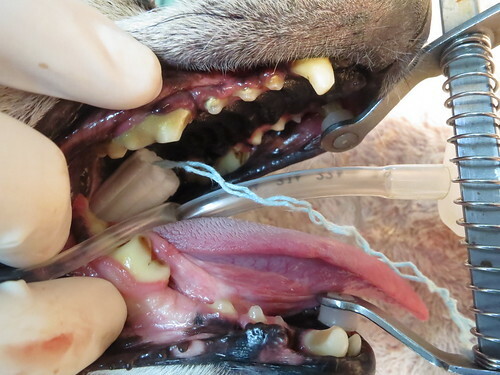 In some canine patients, we can easily determine the culprit tooth. Having said that, sometimes it requires a lot of probing and flushing to definitively determine which tooth requires extraction. This is another case of a tooth root abscess. 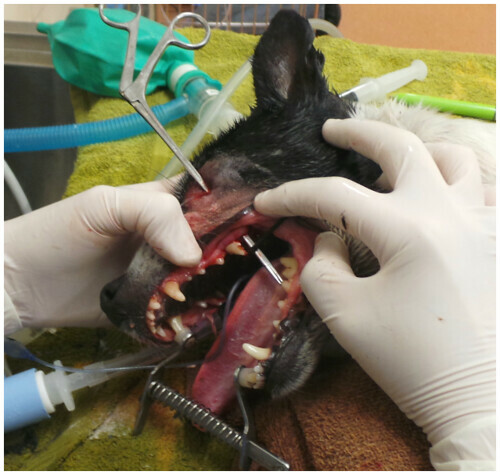 Toby was a very difficult patient to handle and required a full general anesthetic to allow us to examine his mouth. 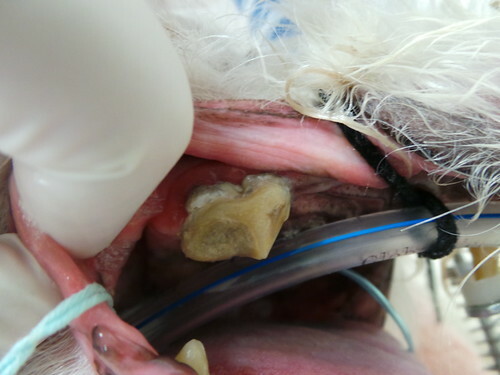 We then proceeded with the curative treatment which involves the extraction of the offender tooth. A course of antibiotics may have resolved the swelling but it would have only been a temporary solution. 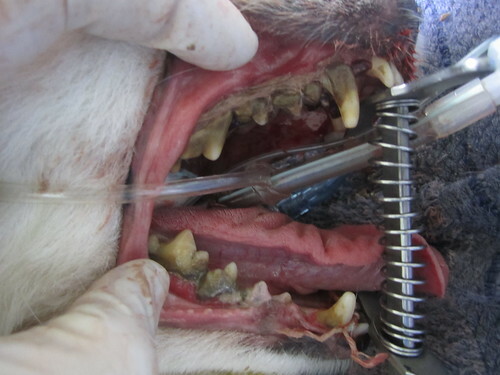 In this picture, I was using an alligator forceps to determine which tooth was the source of his festering infection. I had already extracted one loose upper molar but discovered it was not the one contributing to the abscess. It is crucial to probe the discharging sinus to definitively confirm which tooth requires extraction. There is nothing worse than removing a loose tooth and assuming it is the one contributing to the abscess and then finding out you were wrong. Your patient will have to come back for another general anesthetic because you failed to extract all the necessary teeth. Another very interesting dental case that I dealt with was Gabby. Her owner had brought her into the clinic on several occasions as she was concerned about recurrent sneezing episodes that partially responded to repeat courses of antibiotics. Her oral examination did not reveal any obvious dental disease. I decided it was about time we put her under general anesthetic to look up her nose and do further workup. I quickly discovered the source of her problem when my dental probe disappeared into her gums. You can now understand how easy it was to misdiagnose her condition. Her canines appear healthy and have very little tartar buildup and no visible gingival recession to indicate significant dental disease. 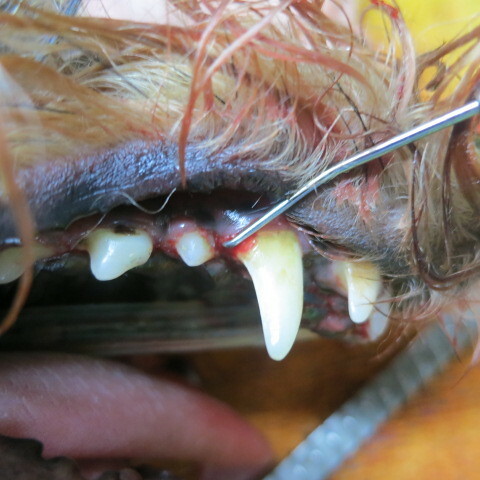 Her upper canines were quite rotten and I extracted both of them without any difficulty. She recovered well and guess what, she stopped sneezing! A note to veterinarians out there, Dachshunds seem quite predisposed to this condition. So please add upper canine tooth root infection to your list of differentials for the next sneezing Dachshund you are presented with. 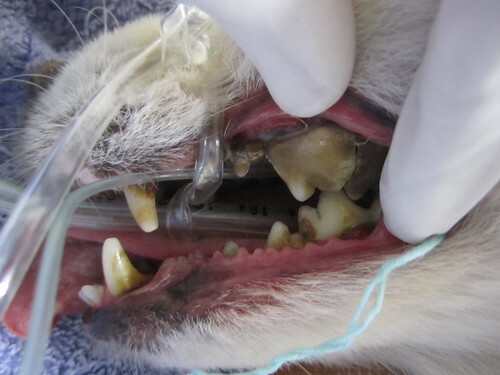 This case illustrates the importance of conducting a general anesthetic to appropriately assess certain dental cases. 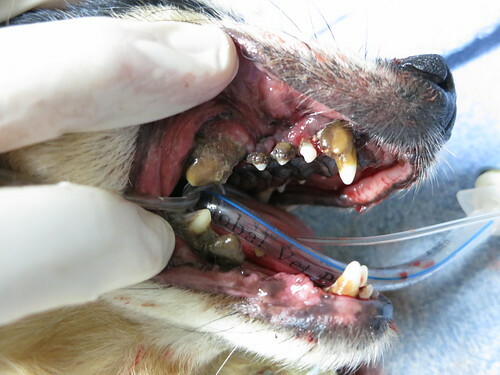 Not many canines or felines (for that matter) will allow you to use a dental probe to inspect their teeth while conscious. This picture is just to illustrate the depth of the root of a dog’s canine. 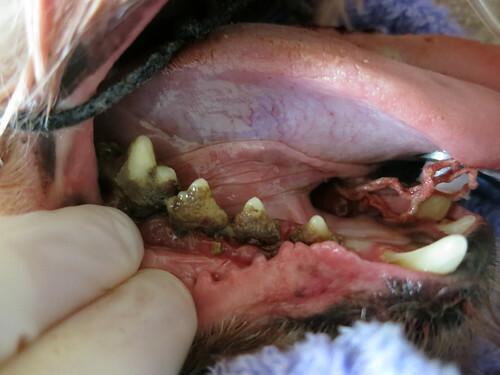 Boof had an gingival swelling revolving around his lower right canine which prompted my colleague to extract it and biopsy the abnormal gingiva. This poor dog was noise phobic and in the process of escaping from the backyard, he managed to pull out his upper left canine. It was merely attached by some gingival tissue. Now that would have hurt A LOT! 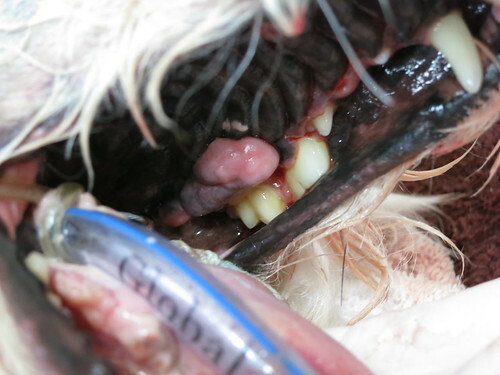 Now it is quite important that I mention oral lumps as these can be another reason you book your dog in for a dental check. In general, oral lumps are often bad news. However, some oral lumps are related to dental disease. You may not be able to visualize some of the oral lumps as they are tucked way back and hiding behind a large tooth. 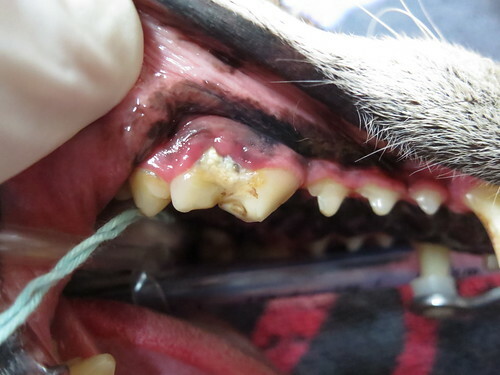 If your dog’s breath suddenly goes really bad, then make sure to get him/her immediately checked out by your local veterinarian as he/she may have developed an oral lump. In this case, the owner quickly identified her dog’s issue and brought her in for a check. Holly had developed a fleshy lump around her upper right most lateral incisor. 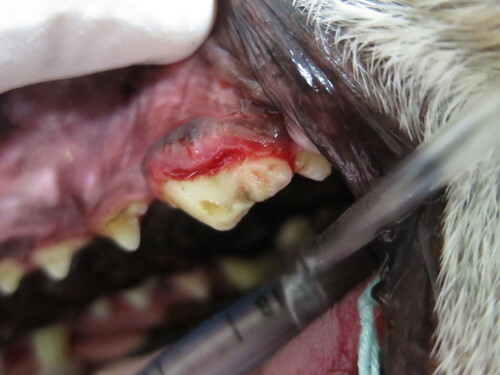 We proceeded with a full general anesthetic and upon closer inspection, it appeared like it was reactive gingival tissue surrounding an infected tooth. We cracked the plaque that was over the infected incisor and thoroughly scaled it. We collected a biopsy sample of the affected gum tissue to rule out an aggressive oral tumor. Thankfully the biopsy results confirmed my suspicion of it just being a reactive benign epulis. This is another case that was booked in for a dental and we incidentally discovered the patient had reactive gum tissue associated with severe dental disease. 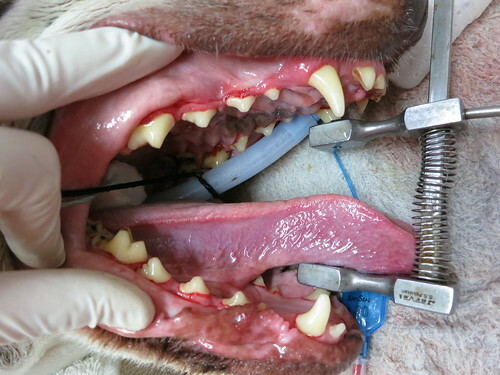 The picture is taken after a thorough dental scale was conducted. 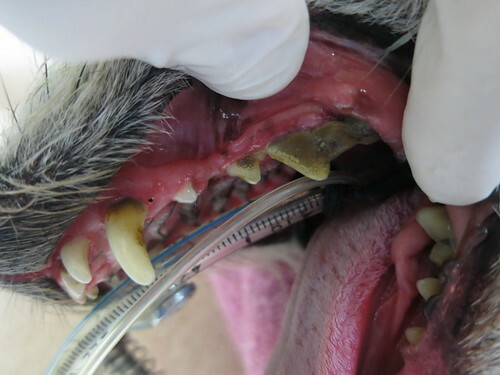 As for this case,we incidentally discovered multiple oral lumps that may or may not be associated with dental disease. 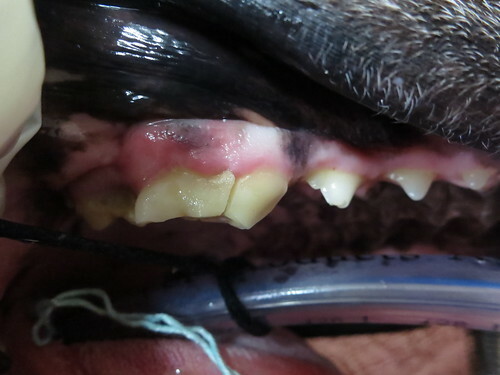 Some of the lumps were in close proximity with infected teeth while others were not. We recommended collecting multiple biopsies as we were concerned they may be nasty oral tumors. 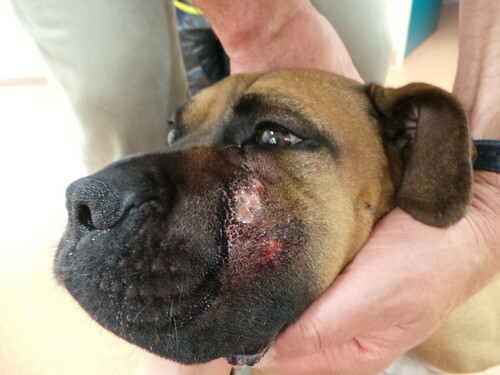 Unfortunately, the owner could not afford sending the lumps away or further treatment. I’m crossing my fingers that they were only associated with plaque and have not progressed since the dental was done. Last but not least, here are some photographs of pre and post dental procedures I have conducted. 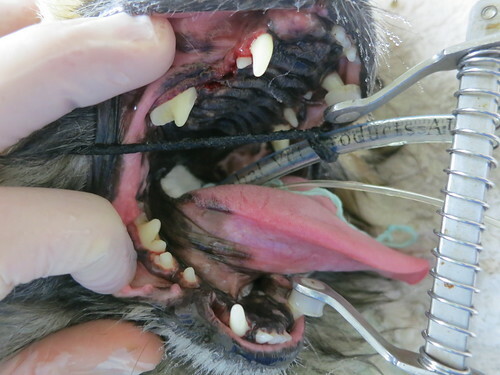 I am always pleased with the finished product and hope more owners will realise the importance of dental hygiene in their dogs. 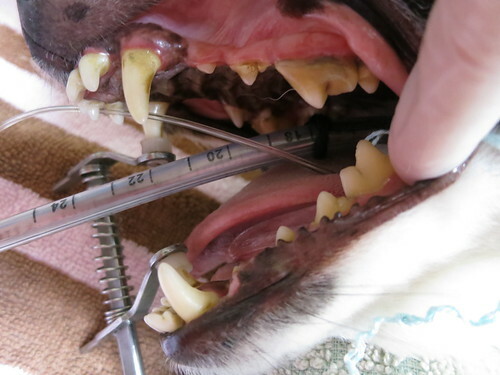 We should be tackling your dog’s dental health early on and not leave it until the dental only involves multiple extractions. A close up of Gracie’s premolars. Star, Frodo and Lilly don’t have any post dental photographs. Why you may ask? Well they barely had any teeth left after the procedure. 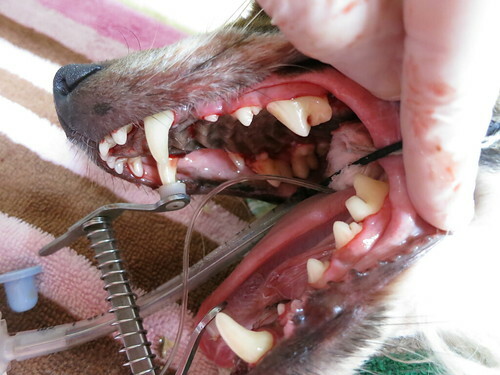 Please do your best to prevent your dogs from reaching these dogs’ state of dental disease. I think I have pumped you with enough information for one session. I will discuss feline dentistry in the next post so make sure to come back and read the last dental sequel. And before I forget, for those of you that live near my clinic, please take advantage of our 25% discount on all dental procedures (dogs and cats) this month! If you happen to live close by, please book in your pet for a free dental check to see if your pet could do with a dental. Wow, after seeing all that it makes me feel slightly better about my dogs. I have strived to keep them on a good kibble and decent chews since they were little. Luna has been raw fed since August but I have not seen any changes in her teeth. I think she just has good genes for teeth too as she is 5 and only has any signs of tartar on her canines. Wyatt our lab on the other hand already has worse teeth than her and he is nearly 3 years old. I will forever be combatting problems with his mouth probably. Are you going to post on some tips for what can help? Do you know of any water additives that actually work? Hey Bev. You are absolutely right, tooth aches are quite painful and so we should make sure our pets dont’t silently suffer from major dental issues. Maus is going to the vet for a tooth cleaning. Thanks for posting. I would hate to think she is in pain. 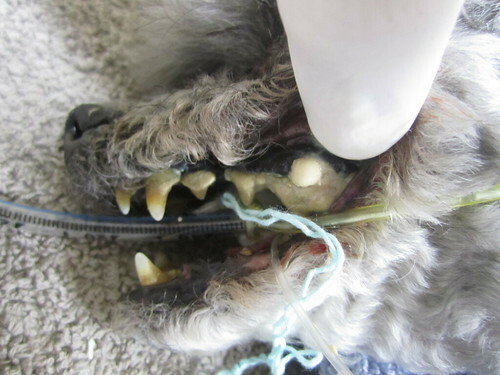 This is always a good reminder to take care of our dog’s teeth. So far, so good, and she likes getting her teeth brushed (lucky for us!) Thanks for these excellent posts. You are very professional. Your post is wonderful and didactic. 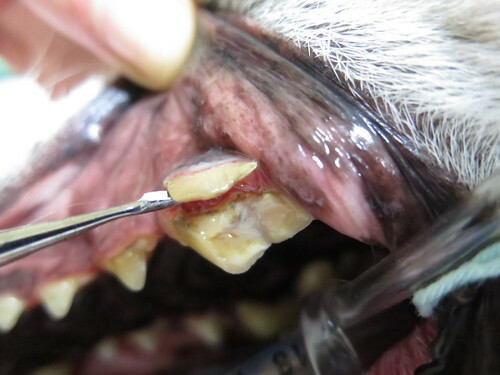 Yes, how about some tips to help keep dogs’ teeth healthy! 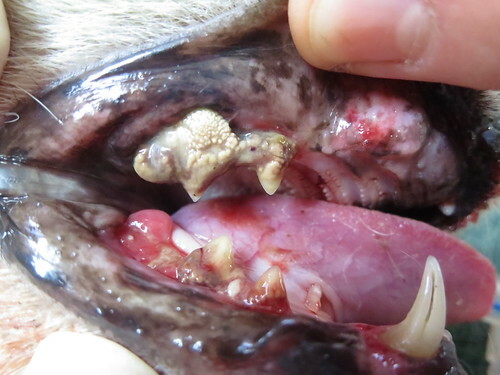 Do wild dogs get tooth decay and gum problems this bad? 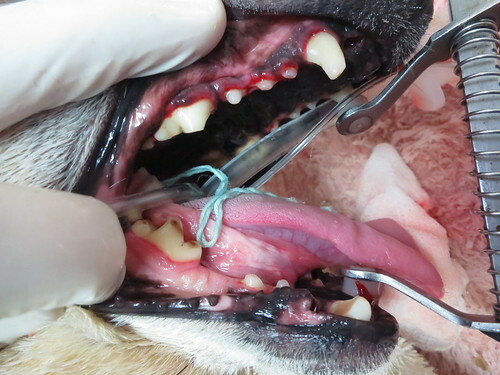 In the wild, dogs feed off carcasses and so suffer from less dental disease. They would be able to survive if they had major dental ailments. 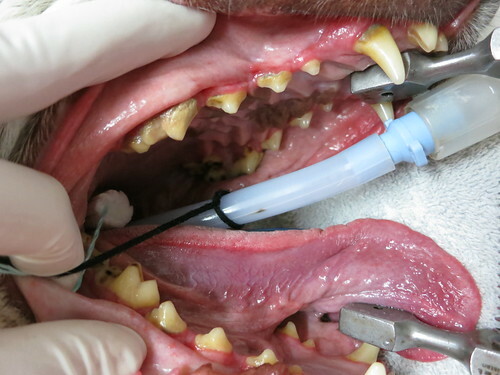 In africa, lots of wildlife veterinarians are involved in performing dentlas on lions in an attempt to save their lives. I will definitely include more information on prevention of dental disease. Thank you very much RAYYA this was very interesting , now our little dog is going for a check up . Rayya, after reading this second post on dental disease, you have motivated me to book Poppy, my 14 year old shih-tzu in for a dental with my vet. I’ve been worried due to her age, but now I feel re-assured, so thank you. My vet does a dental check when my dogs get their physical. BabyGirl is 8 years old and Vet said her teeth look really good. BabyGirl lets me clean her teeth. Midnight I am working on she does not like it. I will get her to come around. Interesting use of tampon! Whatever works, right? Great job in this post. I felt so much better looking at the “post” pics. And so sorry about the ones without. As for what we’re doing in this house, I am working on getting my feline boys to tolerate me going in their mouth. I figure if I keep at it, with great determination, it’ll be worth it. They do not agree! Tough! Well done on your great research. You should never take any information at face value. With regards to the hexarinse which contains 0.12% chlorhexidene. I emailed the vet dentist Dr. Tony Caiafa that recommended the hexarinse product to vets at a dental conference I attended this year. 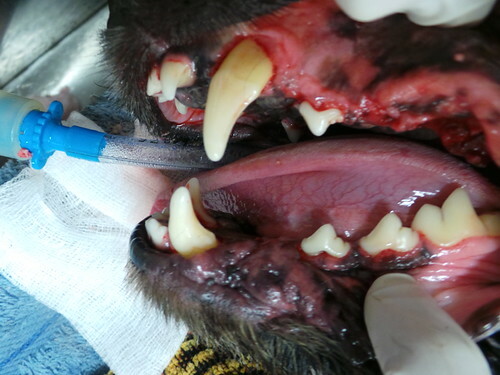 He replied saying the following: The main side effect of chlorhexidene in cats and dogs is staining of teeth. In higher concentrations it may be a mucosal irritant (may cause pharngeal irritation in cats at higher conc. ), so do not use high conc. of chlorhexidene gluconate (0.12% is safe). He has used it on his cats for approx 8 years without side effects apart from the staining but the stain is only an aesthetic issue. It has been used in humans for many years now, and the main side effects are staining (although there are new preparations that do not cause this), possibly increase in calculus formation and altered taste. As for any drug there can be side effects, but if used correctly at the correct concentration, it has proven to be safe, but more importantly it has been shown to be a very good antimicrobial agent against periodontal pathogens. Dear Rayya, this added information is so very helpful, thank you so so much. The takeaway for me is that nuance and specificity is super-important. This you have provided. I need the extra info because I can’t just get ahold of your product here, so I will need to find substitutes. This information from you is so very reassuring. Thank you so so much!!! Your care and attention is infinitely valuable to me. Great posts. Just wondering why there is no mention of dental radiographs. 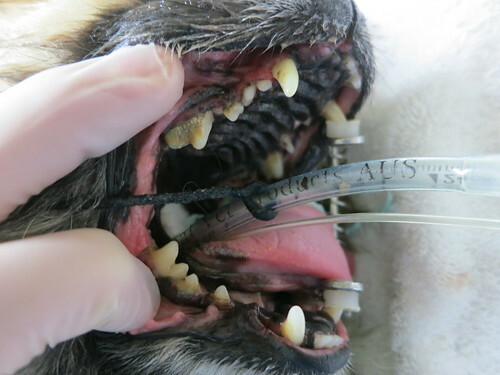 Isn’t this now part of the basic standard of care in veterinary dentistry? You really can’t properly determine which teeth to extract without them. You just end up unnecessarily putting an animal under anesthetic over and over again because some teeth were left in that shouldn’t have been. I have nominated you for a very special Award check it out on my blog. work and coverage! Keep up the superb works guys I’ve incorporated you guys to blogroll. post or vice-versa? My website covers a lot of the same subjects as yours and I think we could greatly benefit from each other. Unfortunately I learnt this too late and my poor wee girl has had her teeth out today and although she is doing well, I am feeling so guilty that I did not realise she needed treatment until it was too late. She had bad breath but never once stopped eating and my husband said she is old, old dogs have bad breath and we just got used to it and unfortunately did nothing until we could no longer stand the smell. I got a good dressing down from the vet and I cried when he showed me her teeth in a jar. How could I have been so stupid not to know. My advice to people is to take your dog to the vet once a year regardless and get them checked out. Prevention is better than cure. I have learnt a valuable lesson but at the expense of my little friend. It is not a nice place to be. 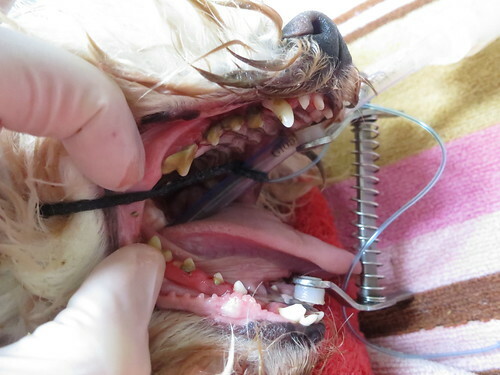 It is never too late to sort out your pet’s dental issues. As I always say, better late then never. Bottom line is she is going to be feeling heaps better now and you will notice the improvement in her quality of life. Thank you so much for sharing your personal experience and shedding light on a very common misconception pet owners go through. We assume pets are okay because they continue to eat. Please stop beating up yourself about it as you have addressed it and are now doing a terrific job of spreading the word out there for all pet owners. How do you treat an old dog with a leaky heart valve with rotten teeth? Our 9 year old (our guess on age) Pomeranian was a homeless stray we picked up about 2.5 years ago. At that time he had 3 teeth left, and those fell out with 6 months. So, for past 2 years he’s been 100% toothless. Could periodontal disease still become a risk to his organs at this point? His lower lip seems to be shriveling up or dissolving, and I’m wondering if that is a symptom of periodontal disease? Hi, Glad to see you mentioning the problem of dog teeth cleaning as it is often overlooked by owners. My Maltese. Sophie eats a lot of dry dog food and occasionally wet. I am bad about sharing my sweets with her. And ice-cream. I noticed she had a double row of bottom front teeth and they started turning brown and now are loose. I am really worried she always eats and chews really hard on big bones. Anything I can do to help her ? We have a 14 yr old named Astro. His teeth are horrible; look similar to Frodo’s. He eats just fine though and haven’t noticed him in any pain or discomfort. If we took him in to get his teeth removed, how would he eat? Do you recommend putting a dog at that age under anesthesia? We love him dearly and want to extend his life as much as we can. Thank you!! Regarding how he’d eat: Our Pomeranian has been 100% toothless for about 3 years now, and eats well with no problem. He eats a small dog food made for senior dogs, and swallows the pieces whole, one by one. The dog food size is about 1 cm. or 3/8 inch. He also loves to eat sweet potato, so we mush it up like baby food into small soft balls, and he can feel like he’s chewing it. There are various other vegetables or dry tofu that he occasionally loves to try a little bit, for instance bok choy, and we’d chew it up first, and give him a little ball. After our Pom lost his final tooth, we noticed how fresh and clean his breath was. I just lost my dog to a seriously rotted tooth. Started to rot in his gums. Very aggressive rescue dog who never let us look in his mouth. 2 years ago we had his teeth cleaned. No issue. Always had smelly breath. No other signs. He started being picky about food 3 wks ago and would tremble. Took him to the vet, xray showed enlarged heart n liver. Drugs were provided for his heart but we treated him for the heart nit realuzing it was an infection in his mouth. But we never could look in his mouth. Until we put him down as he went downhill quickly. My husband looked in his mouth after he passed. The answer was right there in the back of his mouth. Looking back we see small indicators but we thought he’d not eat or would show pain if he had bad teeth. Never did. Now we live in agonizing guilt knowing we could’ve saved him if we only knew. Everyone needs to check their dogs teeth. We couldn’t without losing our fingers ( seriously the vet would need to sedate him first) but knowing what we know now, we would’ve had regular cleanings even if sedation. We feel like we failed our baby. He’d still be here in my arms.